Two quintessential early 20th-century masterpieces that remain ineluctably modern. The New York New Music Ensemble, conducted by Robert Black, returns for its second GM release. (Also see GM2028.) Their performance of Pierrot produces moments of pure revelation, and Phyllis Bryn-Julson's rendering of the famous Pierrot 'Sprechstimme' is finally done as it was meant to be. 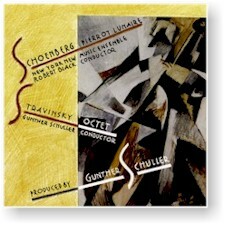 For the CD's finale, Gunther Schuller has assembled an elite cast of New York chamber musicians, and their reading of the Octet splendidly captures the beauty and refined craft of Stravinsky's neo-classic gem. "Perhaps the best new music group in the country." "A gem of a group." Frank Morelli, Susan Heinemann, bassoon; Ronald Borror, trombone; David Taylor, bass trombone; Raymond Mase, Chris Gekker, trumpet. Recorded at the State University of New York at Purchase, New York.